For many people the thought of filing for bankruptcy is devastating. If it turns out that you need to file and you simply cannot pay off your debt, listen to the advice of your bankruptcy attorney and don’t panic. 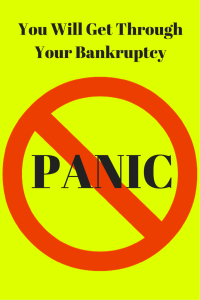 There are several panic mode incidents which will lead to harm in your bankruptcy. Some of these instances are obvious while others are not so obvious. Before you transfer assets, before you liquidate property and before you do anything out of the normal course of your financial life, talk to an experienced bankruptcy attorney about the options available to you. One panic mode to avoid would be to charge up all your credit cards to the max. Human nature would say that as long as you are going down, you might as well go down big. This thought leads people to take out whatever additional credit may be available on their credit cards prior to filing. This also leads people to take out cash advances or make large purchases in anticipation of filing for bankruptcy. This running up credit can lead to an objection to discharge of those particular debts. This means that if the creditor is successful, the debtor will still owe the recent charges despite having filed for bankruptcy. Another panic mode is transferring property out of one’s name in anticipation of filing. This could mean closing a bank account with more than the exemption amount on hand. This could mean transferring a paid-up vehicle to a friend or family member for less than its fair market value. This could mean transferring a piece of real estate or quit claim deeding an interest in real estate to another without adequate consideration. These transfers can be undone by a chapter 7 bankruptcy trustee. The trustee has what is called avoiding powers. A smart trustee will be able to petition the court to have the property transferred back to the debtor. If there is equity in their property, the trustee can liquidate the property and the funds would be applied to the creditors on a pro rata share. These types of panic mistakes can be avoided by simply talking with an attorney and following the sound advice. You may discover that doing nothing is actually going to be your best option. By transferring property or running up debt, you bring unnecessary suspicion upon your activities. You may alert the trustee to examine different financial aspects of your life that were not necessary. Your attorney will advise you as to whether or not property is protectable, whether it can be shielded from creditors or whether it must be liquidated. The attorney can also talk to you about different chapters under the bankruptcy code which would provide different results. If the chapter 7 fresh start is not available due to your assets, then the attorney will likely recommend a chapter 13 reorganization plan. The amount that you pay back is based upon your income, expenses, assets and liabilities. In some cases, you may decide that filing for bankruptcy is not going to be in your best interest. In those cases, the attorney will advise you of other options. The bottom line is this. If you are considering bankruptcy or feel at some point that you may need to file a bankruptcy, don’t panic. Seek legal advice before you make any drastic changes to your financial situation. You may discover that by doing nothing, you will actually have helped your case succeed.